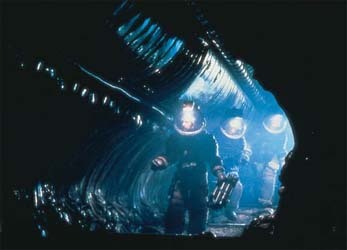 1) Alien was filmed in Panavision widescreen 70mm, a film format exactly twice the size of regular film. This means that when the film is projected on a cinema screen, it is twice as crisp and sharp as normal film, replicating digital quality. 2) The fact that Alien was filmed in widescreen (ratio 2.35:1) means that roughly 50% of the screen image is lost when presented on normal-sized television, the ratio of which is 4:3 - ie, almost square. Even widescreen televisions have a ratio of 16:9, meaning that either 33% of the image is lost, or - if the image is reproduced in full - black bars still appear across the top and bottom of the screen. 3) Filming Alien in widescreen gave director Ridley Scott the ability to use the entire frame of the film to his advantage, hiding movement in every darkened recess of the screen. Most of this disquieting effect, which adds greatly to the chill factor, is lost on the small screen. 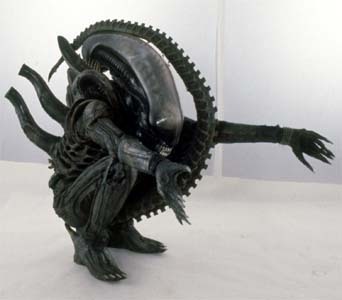 4) Many of Alien's groundbreaking special effects were achieved using 'physical' effects such as miniatures and full-scale sets, rather than post-production effects. This means that, when viewed on a cinema screen, Alien special effects - notably, the terrifying alien creature itself - look even more realistic than they do on the small screen - and twice as scary. 5) The claustrophobia and sense of dread which Ridley Scott carefully built in filming Alien is partially lost when the film is viewed in the environment of, say, a living room. The darkened environment and relative dearth of distractions of a cinema makes it the perfect venue to watch one of the scariest movies ever made. 6) Alien was released in 1979, at a time when cinema sound systems were virtually unchanged since the inception of the first 'talking pictures' half a century earlier. 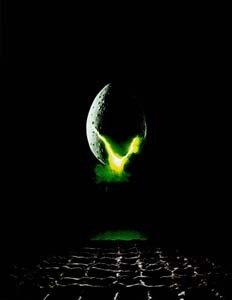 Today, the film has been remastered in THX digital surround sound, making Alien far scarier than it was when the original version was released. 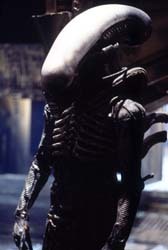 7) Although Alien certainly has its fair share of shock moments, what Ridley Scott biographer Paul M Sammon has described as "Scott's meticulous attention to the mechanics of cinematic unease, including long, quiet, protracted 'takes' suddenly shattered... by unexpected shrieks of sound or jolting slashes of movement" which make Alien one of the scariest movies ever made. Naturally, there is no better place to experience this than a cinema. 8) Ridley Scott's almost unprecedented melding of the conventions of science fiction and horror make Alien one of cinema's true milestones. Seeing it on the big screen is the only way to re-create the fear and dread with which cinema audiences were first greeted when the film became one of the first major science fiction films to follow George Lucas's Star Wars, released two years earlier in 1977. 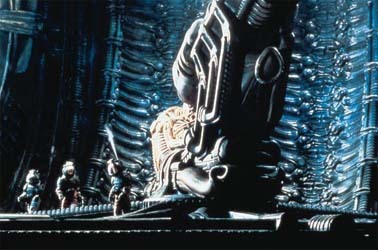 9) One of the most important elements for Ridley Scott was Alien's production design. Scott deliberately hired different artists - production designer Ron Cobb and Swiss surrealist H R Giger - to conceptualise the human and alien elements of the film, resulting in one of the most distinctive looking films of all time. The spacecraft Nostromo, its environments, uniforms and electronic equipment, all attest to a 'used future' - something virtually unseen in the shiny and sleek science fiction up to that point. 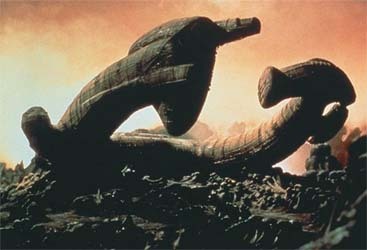 The alien creatures and the derelict ship, meanwhile, have an otherworldly look which has often been copied but never improved upon. As might be expected, the cinema screen is the only place such attention to detail can truly be appreciated. 10) In addition to being restored and remastered specially for the cinema, using state of the art THX digital sound, Alien: The Director's Cut incorporates several minutes of footage never before seen in cinemas. 1) Alien was originally written by Dan O'Bannon - who co-wrote and co-starred in John Carpenter's 1974 sci-fi comedy Dark Star. When the film failed to find an audience, O'Bannon suggested to friend Ronald Shusett that perhaps it was easier to write something that would scare people than make them laugh. Thus, they set to work on a script which would one day become Alien. The original title: Star Beast. 2) Before deciding to make Alien, Ridley Scott had been planning to follow his first film, The Duellists, with an adaptation of Tristan and Isolde. He changed his mind after being invited to a screening of Star Wars. "I thought 'I must be out of my mind!'" he later recalled. "This is what cinema is about!" Scott soon abandoned his plans to make Tristan and Isolde and let his agent know that he was looking for a science fiction film. 3) When Scott received the Alien screenplay, he was immediately hooked - "right from the first page. In fact, I finished the thing in a single go, in under an hour and a half, which is an extremely rare thing for me to do. I was so impressed with the Alien screenplay that, within twenty-four hours of my reading it, I had decided that this would be my next film." 4) Ripley was originally scripted to be a male character. When one of the producers suggested that they could change all the rules of science fiction films by making her - essentially the hero - a woman, Ridley Scott embraced the idea and a movie legend was born. 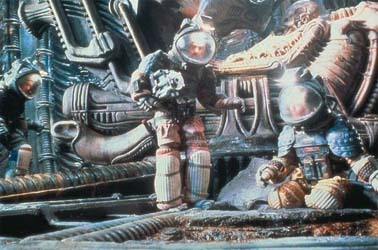 5) According to Ridley Scott, fresh oysters and clams were used for the facehugger innards. Model soldiers and children in spacesuits - including Scott's two sons, now both directors in their own right - were used to portray miniature astronauts. 6) Actress Veronica Cartwright, who plays the part of Lambert, was originally cast in the role of Ripley. She only found out that she was playing Lambert instead when she read the nametag on her uniform during costume fitting. "I thought I was playing Ripley," she says. "That's the only part I'd ever read for, so that's what I thought. I'd never even looked at the script from the point of view of Lambert, so I had to reread the script." 7) The 'chestburster' scene, arguably the film's most famous, was achieved by having John Hurt sit in a deckchair under a table, with his head joined to a false body, leaving his head writhing and his arms thrashing. (A similar technique is used when Ash's severed head is revived later in the film.) Scott had not warned the cast what would happen when the creature burst from John Hurt's chest - that they would all be sprayed with pig's blood - because he wanted their reactions to be real. They are. 8) The ship at the centre of the story was originally named the Snark, after the legendary creature being sought in Lewis Carroll's poem The Hunting of the Snark. Its next name was Leviathan - a reference to its enormous size - before Scott eventually settled on Nostromo, the title of a novel by Joseph Conrad, a quotation from whom opens the screenplay: "We live as we dream - alone." 9) In addition to being restored and remastered, Alien: The Director's Cut incorporates several minutes of footage never before seen in cinemas: notably a scene in which Ripley (Sigourney Weaver) discovers Dallas (Tom Skerritt) cocooned by the alien creatures. 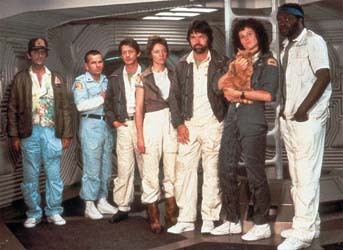 10) Released on 25 May 1979 on just 91 screens - far fewer than the release of Alien: The Director's Cut - Alien grossed just $3.5 million during its weekend debut, but went on to earn a massive $78.9 million in the US alone.